Waxman Training Academy is pleased to introduce a NEW HETAS course that has been tailor-made for solid fuel retailers. The HETAS Approved Retailer qualification has been introduced to help retail and showroom staff offer high-quality information and advice to their customers, with credentials that back it up. The course aims to ensure that approved retailers have a minimum of one trained member of staff to hand, at all times, so customers can receive informed advice from knowledgeable sales people. Customers will benefit from advice on all aspects of solid fuels from maintenance to carbon monoxide, as well as industry regulations and fuel types, from a fully trained employee. As demand for solid fuels rises, so does customer understanding of the importance of HETAS approved appliances and installers. This course has been developed to ensure this increasing demand is met by training the on-the-floor sales team on the vital information necessary for individuals looking for further advice. The Approved Retailer course is theory based meaning HETAS trainers can visit showrooms and train staff in groups of four or more, for a bespoke training experience which may be helpful in busy seasons. For individuals or smaller groups, training is available in local HETAS Accredited training centres, of which Waxman Training Academy is one, to provide trainees with interactive sessions giving a detailed understanding of solid fuel types and appliances, storage and legislation applying to dwellings. That’s not the only advantage of training on the HETAS Approved Retailer course. Once qualified, retailers will have access to the HETAS logo and marketing collateral to help promote the retailers’ due diligence and instil customer confidence. The HETAS guide to products will also be available to help freshly trained delegated refresh their memory and provide specific information for a variety of products; combine this with the HETAS technical helpline and you could offer your customers a high quality service that others cannot. Waxman Training is running this course on a regular basis. To see when our next HETAS Approved Retailer course is head to our course calendar which lists all our upcoming training courses. 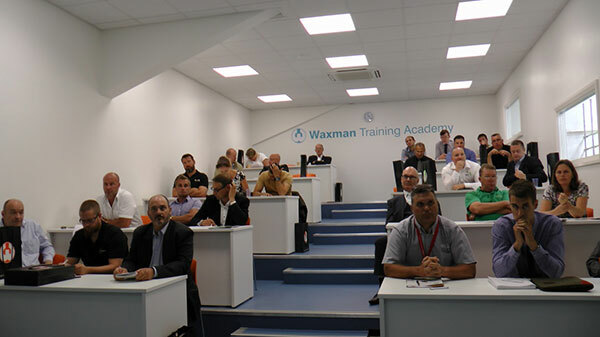 Waxman Training Academy gets top marks!